Tesla announced the purchase of California-based Maxwell Technologies, an expert in battery development, part-owned by Russia’s Rusnano. The American corporation will pay for the new asset with its own securities. As a result, the Russian co-owners of Maxwell Technologies will become Tesla shareholders. Along with Rusnano, Maxwell Technologies shares are owned by two Russian funds, Arbat Capital and I2BF Energy, founded by former Yukos executive Alexei Golubovich and his son. According to Vedomosti, Rusnano invested $19 mio in Nesscap, a company producing supercapacitors, in 2011. The investment plan involved building a plant in Russia, but the parties were unable to develop a business plan that would suit everyone, so most of the funds, $15 mio, were returned to the Russian side. Nevertheless, part of the shares remained in Rusnano’s portfolio. In 2017, Nesscap acquired Maxwell Technologies. The Russian company’s share in the new enterprise was about 0.2%, but a part of the shares was sold subsequently on the open market. The remaining stake can be converted into 0.00006% of Tesla shares. 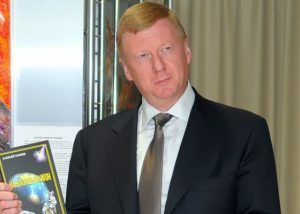 In April 2018, at the Digital Forum in St. Petersburg, Rusnano head Anatoly Chubais argued with Natalia Kasperskaya about the significance of Elon Musk and his projects. Chubais then called Musk a genius who made an engineering breakthrough. Previous ArticleBlockchain will be used for housing and utilities paymentsNext ArticleWill Russian cosmonauts land on the Moon?